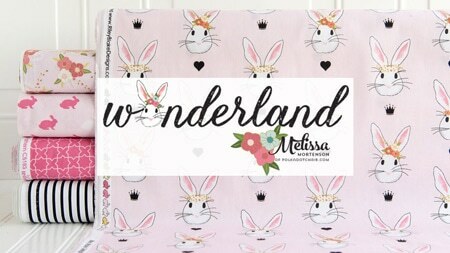 A great big thank you to SayitwithApplique.com for providing the supplies for, and sponsoring this tutorial! All work and opinions are 100% mine. 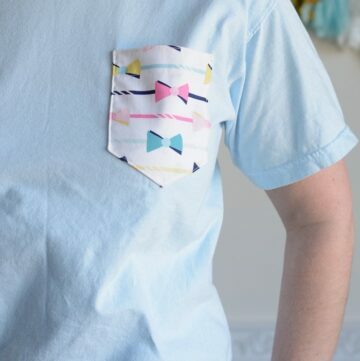 Last year my oldest daughter came to me and said “Mom, I found a new project for your blog!” She proceeded to show me some photos of t-shirts with colorful pockets sewn on. 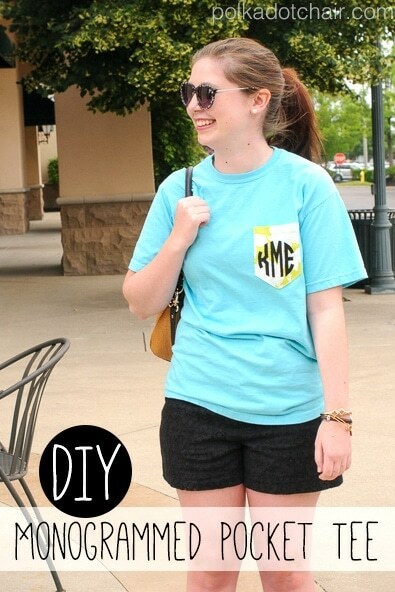 I thought “hey, that would be a fun project”.. and filed away a pocket tee tutorial onto my “to do” list. 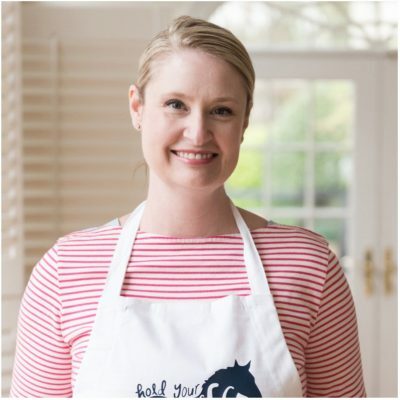 Then last summer we were out shopping and she wanted to buy one of the pocket t-shirts that she had shown me earlier, I thought “ok” then I looked at the price tag and had a “don’t buy that I can make it!” moment. I talked her out of it convincing her that we could make one at home and she could pick whatever fabric she wanted on the pocket. Fast forward a year, she headed off to college out west and along with missing her I admit I lost one of my creative “muses”. She was always so good (and excited) to suggest new projects for my blog ( and was a huge help coming up with ideas for my book). Well…. 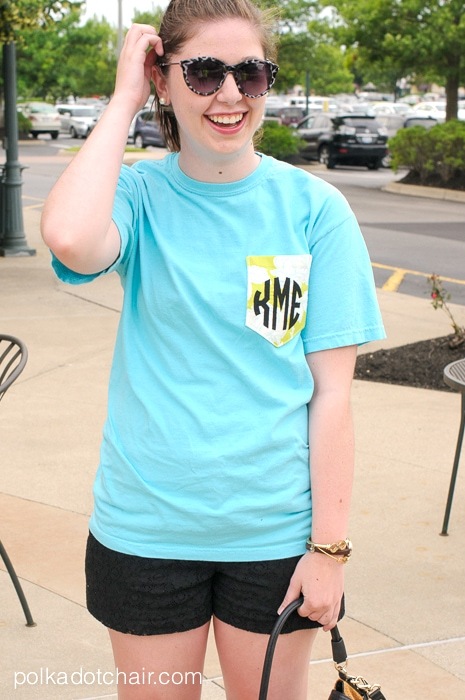 she’s home for the summer (although only temporarily, she’s headed off to Europe for a study abroad later this summer)… and so it was finally time to make her a pocket t-shirt. 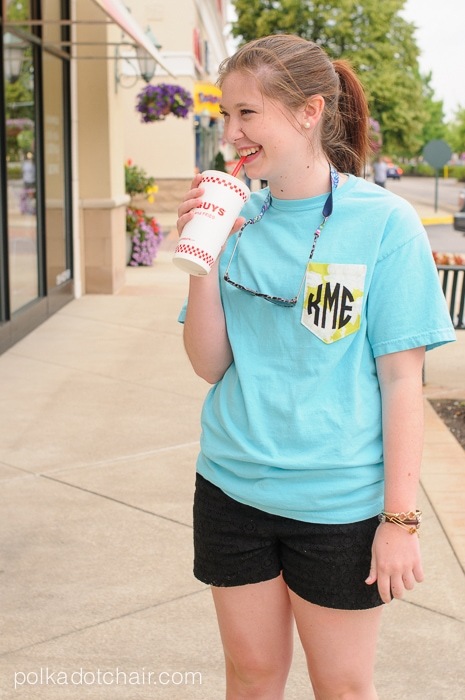 She’s been obsessed with monogramming EVERYTHING this year. 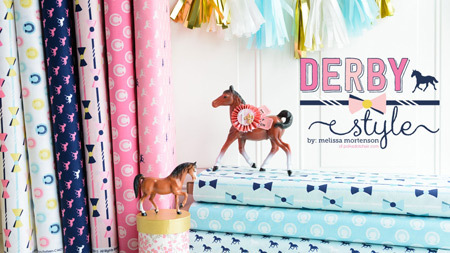 I think it stems from growing up in the South and moving out West where monogramming is not quite as popular. To her I think it’s a little something that reminds her of home. The kind folks at Say it with Applique contacted me about working with some of their laser cut fabric letters last Spring. I knew that they would be a great fit for this project. 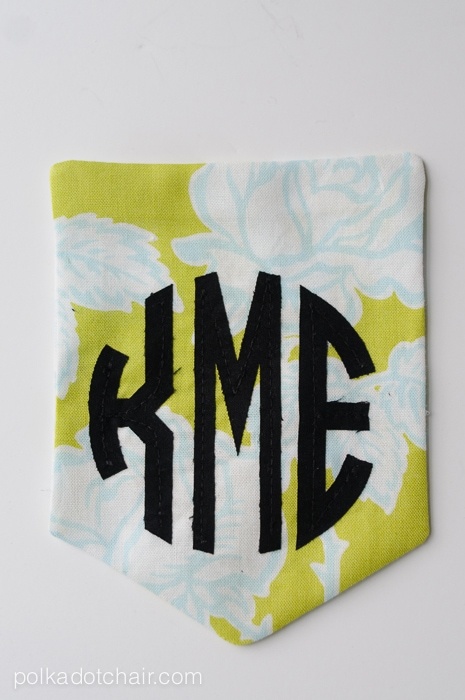 (I’ve got another fun monogram project from them coming next week!) 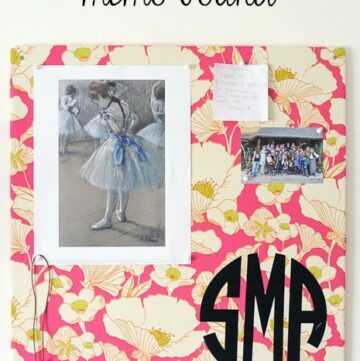 I promptly order my daughters monogram. Then it showed up in the mail and I found out that ORDERED THE WRONG LETTERS! (just to be clear, they sent the ones I ordered, I just ordered the wrong ones)… Worst thing, I didn’t even notice until she pointed it out! Yes, total DUH moment, I seriously don’t know my own daughter’s initials???? I had messed up and ordered my middle name as hers— I swear I wonder where my brain is going. 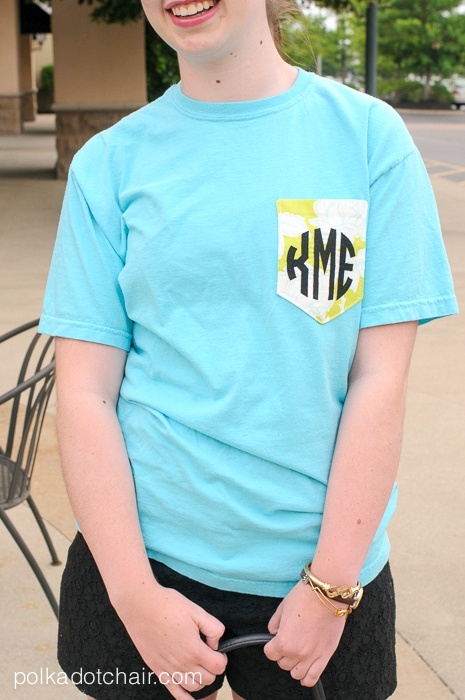 After quickly reordering the right monogram and having them show up really fast, I got to work on her t-shirt. 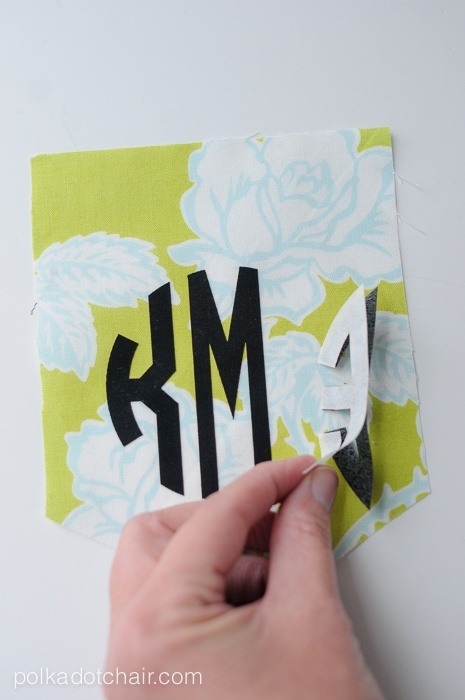 Say it with Applique offer letters and monograms that are pre-fused and laser cut. 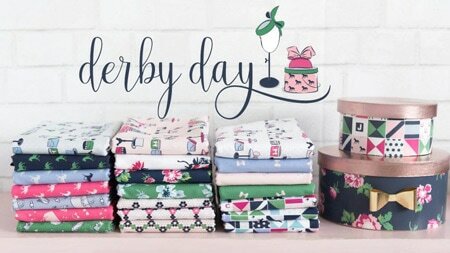 The thing I like about them the best is that their letters (aside from the fact that they are laser cut, hallelujah) are all cut from high quality 100% cotton fabrics. 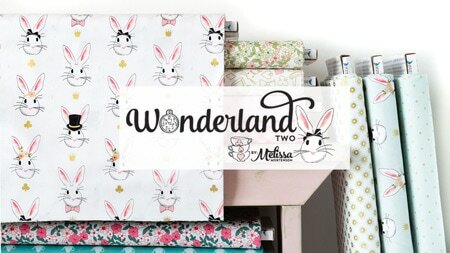 They have several fonts and colors to choose from. If you’ve ever wanted to add a name to a project you’re working on, these are perfect. 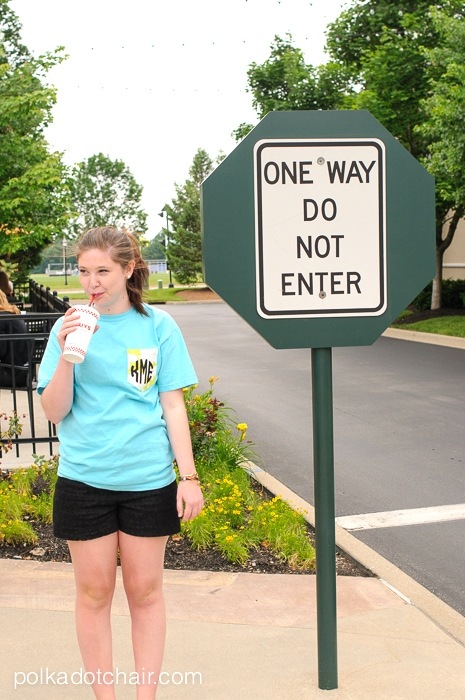 I chose to work with the circle monograms. They come in two sizes small and large. The one on the t-shirt is the small monogram, next week I’ll share a project using the large circle monogram. 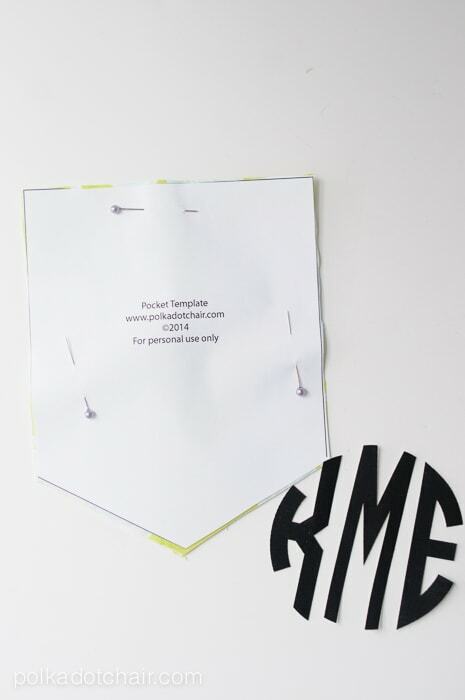 Begin by cutting out two pieces of fabric from the pocket template piece. On one pocket piece apply the monogram. Start in the center and apply one letter at a time. 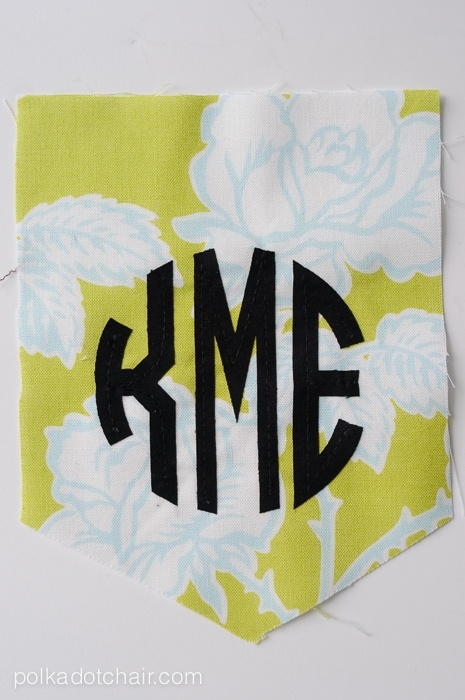 Just peel the back off of the letter and iron onto the fabric. Since I knew that this shirt would be washed a lot I decided to also stitch the letters down. To make it simple, I stitched down the center of each letter in matching thread. 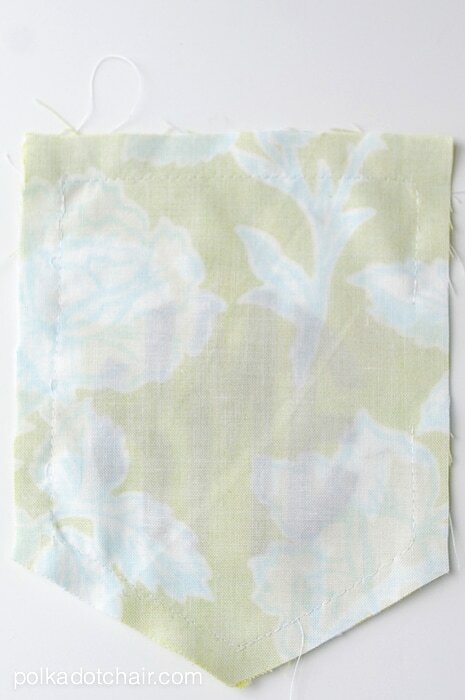 Next put your two pocket pieces right sides together and stitch with a 1/2″ seam allowance. Leave 2″ opening in one side of the pocket to turn it right side out. Clip the corners and turn right side out and press. For a bit of extra detail, stitch a line 3/4″ down from the top of the pocket. 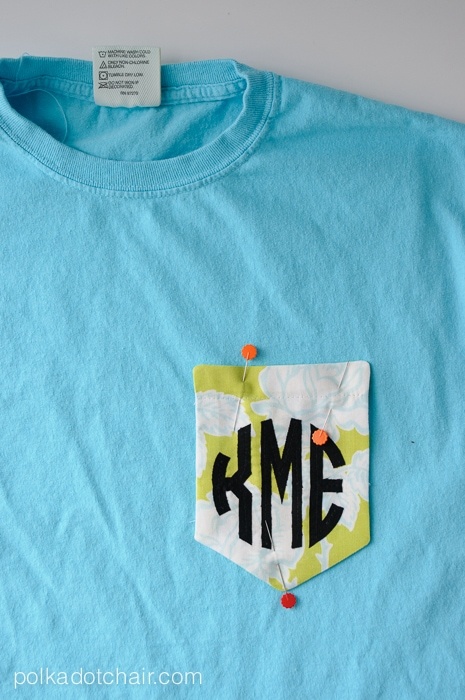 Pin the pocket to the t-shirt in the desired location and stitch in place. Be sure to backstitch a few times at the top of the pocket. That’s it! 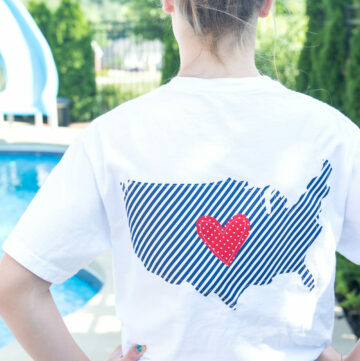 The shirts are so quick and easy to make I may even make her a few more! 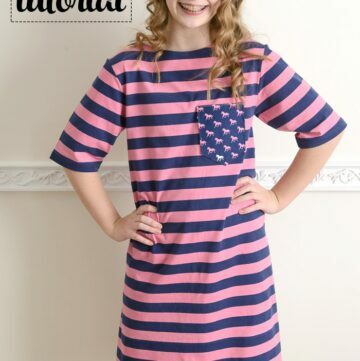 To find out more about Say it with Applique visit their website. It’s there now, sometimes the templates page doesn’t update when the post goes live.